Prime Minister Saad Hariri's unity government collapsed two weeks ago when ministers loyal to Hezbollah quit their posts. Beirut, Lebanon (CNN) -- The political crisis unfolding in Lebanon for several weeks heated up Monday with street demonstrations across the country, while supporters of the outgoing prime minister accused Iranian-backed Hezbollah of attempting a take control of the government. Lebanese President Michel Suleiman met with parliament on Monday over who should be the country's next prime minister -- a key step in reassembling the country's government after its collapse two weeks ago. Meanwhile, supporters of outgoing Prime Minister Saad Hariri's Western-backed Future Movement took to the streets to express their disapproval hours after former Prime Minister Najib Mikati was endorsed by Hezbollah for the prime minister post to head a new government. Civilian demonstrations in support of Hariri broke out Monday in Beirut's Tarik Al Jadiddeh and Qasqas neighborhoods, as well as in the northern city of Tripoli; the towns of Minieh and Al Abdeh; and the southern city of Saida, Lebanon's internal security forces told CNN. Protesters blocked some roads with burning tires, but security forces along with the Lebanese army reopened the roads and dispersed the protesters, authorities said. The forces and army were working on reopening a road in Jiyyeh, on the main highway linking Beirut to the south. No arrests or injuries were reported. Roads were blocked by demonstrators in Beirut, while angry protestors burned tires along the coastal highway in Tripoli and other cities in the north. "This is an indication that there is the potential for flash points and violence," said CNN's Senior International Corrispondent Nic Robertson. On Monday, Hariri's press office issued a statement saying it refuses to participate in any government "headed by the candidate of the opposition." Hariri had stayed on as a caretaker prime minister at the request of President Suleiman. "Miqati is seen as a relative moderate; he's a Harvard educated, multi-billionaire businessman and a former prime minister of Lebanon," said Robertson. "But Saad Hariri's supporters say that Miqati is going to form a government that would favor Hezbollah," added Robertson. The Furture Moment also accuses Hezbollah of dragging Lebanon and the Sunni post of the prime minister under the guardianship of Velayat Al-Faqih -- Iran's Shiite form of Islamic rule. "Our demands are clear and that is to shoot down Hezbollah's bid to take the post of the prime minister in an armed robbery move for the sake of Velayat Al-Faqih," said Ammar Houri, a member of the Future Movement. Members of the Future Movement have called for a "day of anger" across Lebanon on Tuesday. The United States considers Hezbollah, which has close ties to Iran and Syria, to be a terrorist organization. The group is a political party and a major provider of social services in Lebanon, in addition to operating a militant wing. State Department spokesman P.J. Crowley said Monday that the United States would have "great concerns" about a government in which Hezbollah plays a leading role. "We want to see a government emerge in Lebanon that will serve the interests of the people of Lebanon and will sustain the independence and sovereignty of Lebanon," said Crowley. "We want to see a government that will continue to support the work of the tribunal. So ... we're going to wait and see as this constitutional process unfolds, said Crowley. 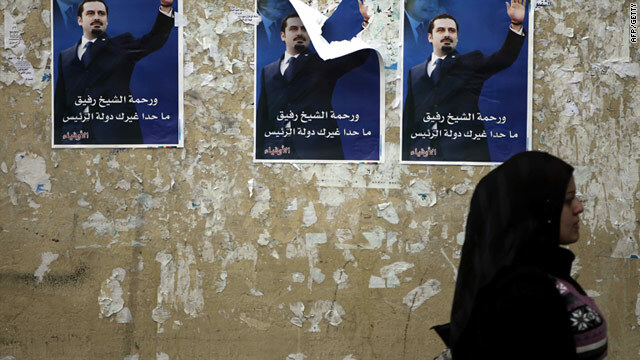 Lebanon's unity government fell apart when ministers loyal to Hezbollah quit their posts. The dispute centered on a U.N.-backed tribunal's investigation into the 2005 assassination of former Prime Minister Rafik Hariri. Hezbollah withdrew its support for Hariri's government earlier this month because of Hariri's cooperation with the Special Tribunal for Lebanon, which is expected to indict members of the Shiite Muslim militant group in connection with the Rafik Hariri assassination. Hezbollah leader Hassan Nasrallah said he would withhold his views on the tribunal until it announces any decision, a move expected in six to 10 weeks. But he urged Hezbollah's domestic rivals not to use the pending decision "to serve your political ends." Under the peace agreement that ended Lebanon's 15-year civil war in 1990, Hezbollah's Iranian-backed militia is the only faction in Lebanon's fractious politics allowed to keep an armed wing. Clashes between the group and Lebanese authorities in 2008 brought the country to the brink of a new civil war.